You have heard of mother Nottingham, who for her time was pretty well skilled in casting of waters: and after her, Mother Bombye; and there is one Hatfield in Pepper-Alley, hee doth prettie well for a thing that’s lost. 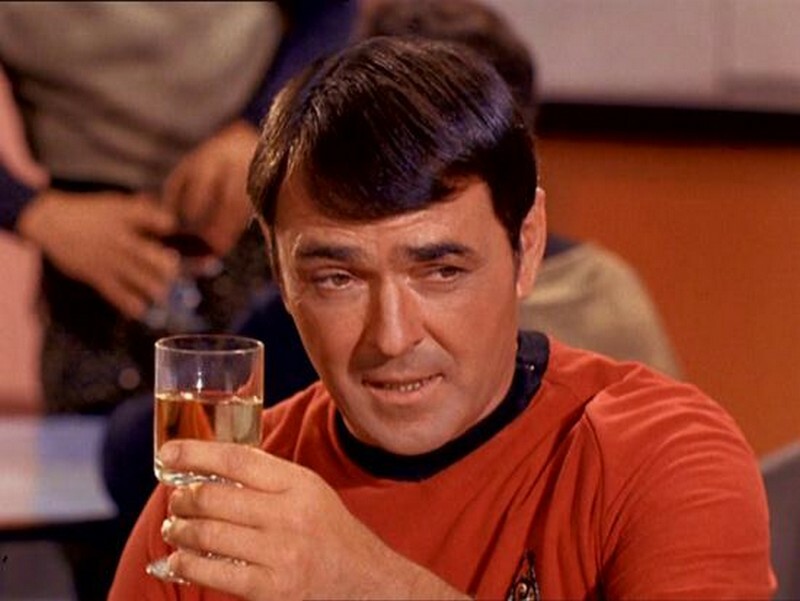 There’s another in Coleharbour, that’s skilled in the Planets. Mother Sturton in Goulden-lane, is Fore-speaking: Mother Phillips of the Banke-side is for the weaknesse of the backe: and then there’s a very reverent Matron on Clarkenwell-Green, good at many things: Mistris Mary on the Banke-side is for recting a Figure: and one (what doe you call her) in Westminster, that practiseth the Booke and the Key, and the Sive and the Shears: and all doe well, according to their talent. For myselfe, let he world speake. 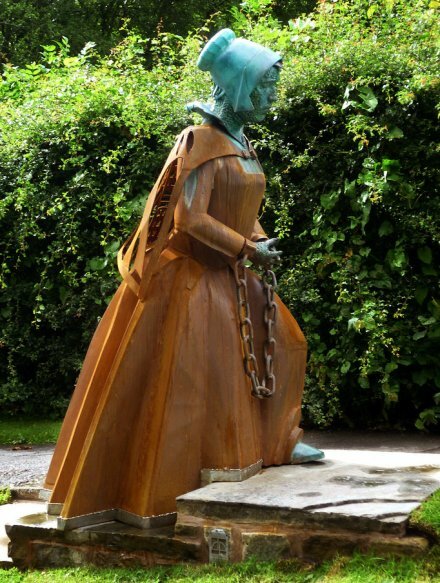 This date marks the 400th anniversary of the Pendle witches‘ hanging — perhaps the most notorious witchcraft execution in English history. Eight women and two men — Alizon Device, her brother James Device, and their mother Elizabeth Device of the Demdike family; Anne Whittle and her daughter Anne Redferne of the Chattox family; Jane Bulcock and her son John Bulcock; Alice Nutter; Katherine Hewitt; and Isabel Robey* — hanged together this date at Lancaster’s Gallows Hill after being tried over the preceding 48 hours; they, along with a woman named Jennet Preston hanged at York on July 29, comprise the Pendle Witches. It’s an extraordinarily sad case. 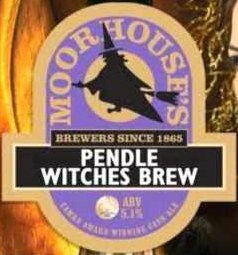 The prosecution of the Pendle witches bubbled out of a witches’ brew of circumstances particular to early-17th century England. There was, to begin with, a new(ish) English king, James I and the guy had a major jones for hunting those early modern supernatural terrorists, witches. 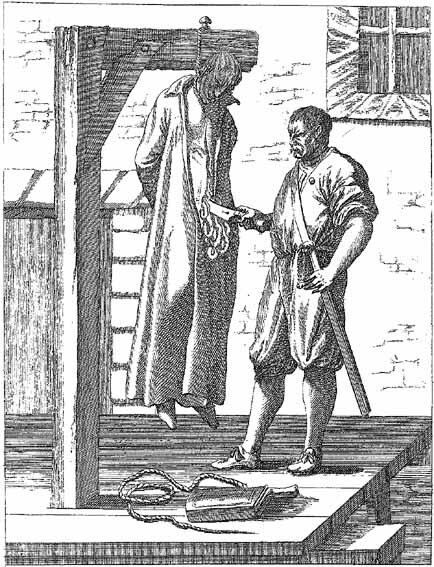 ** The guy even wrote his own book, Daemonologie, to establish “that such divelish artes have bene and are … [and] what exact trial and severe punishment they merite.” A 1604 law had accordingly broadened the reach of the death penalty for supposed instances of sorcery. Coming as this did in the aftermath of the Tudor Reformation, the nebulous concept of “witchcraft” was handy as well for clamping down on any excessively Catholic practices that might strike the right authorities as subversive, intransigent, or impious. Lancashire where we lay our scene was just such a Catholic-leaning zone. Lancashire also had, as almost everywhere in the Isles, its share of “cunning folk” — workers of everyday folk magic whose widely tolerated practices could also be taken by a hostile viewer as Catholic superstition and/or hard-core infernal trafficking. So, these are the brew’s ingredients. Add wool of bat and tongue of dog, stir vigorously … and serve with a length of hemp. The Pendle witches brew started bubbling with a freak incident: a cunning woman named Alizon Device (you’ll recognize her name from the list of the hanged, above) tried to beg some needles from a passing peddler. The latter refusing her, Alizon cursed him, just like you do when you’re cut off in traffic. Except in this case, the peddler promptly suffered a stroke. Everyone was spooked at this apparent effusion of transmundane malevolence, nobody more so than Alizon herself. She became the first arrestee, and in the end would go the gallows convinced of her own sorcery. She also started accusing others of occult involvement, either from a sense of panicked guilt or a blithe ignorance that the new legal regime would be interpreting folk spells as capital crimes. This led her bizarre instance of passing-peddler-popping to become a full-on witch hunt. Alizon Device came from a whole family, the Demdykes or Demdikes, of cunning-women, and she implicated her own grandmother for having taught her the witchy ways. 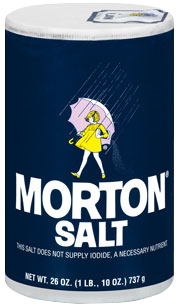 (Grandma would be spared the ignominy of hanging because she suffered the ignominy of dying in the filthy dungeon.) Alizon also accused a rival family, the Chattoxes, themselves well-known as “witches”, and she also implicated the matriarch of that family, Anne Whittle. 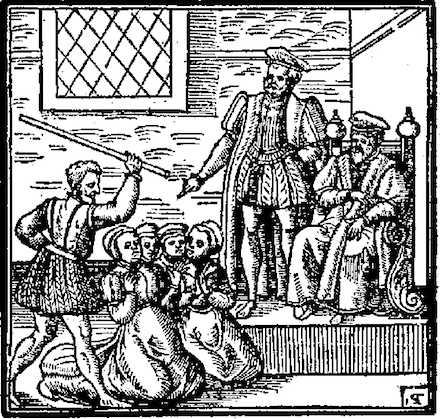 The dreadful progress of the ensuing investigation, in which the feuding locals hanged each other with the aid of an ambitious local magistrate, is widely available — thanks to the record one lawyer witness to the proceedings set down in his credulous 1613 chapbook The Wonderfull Discoverie of Witches in the Countie of Lancaster. Once these initial arrests were in the books, Alizon’s mother Elizabeth apparently convened a solidarity meeting at a hut with the diabolically menacing name of Malkin† Tower. Dining on stolen mutton, and on Good Friday no less, they may have worked out a plan to liberate the prisoners from Lancaster Castle (at least, the Demdike prisoners). But the magistrate got wind of this confabulation and burst in to arrest those participants, too. As these secondary circles were pulled into the investigation, so too were past years of community gossip about these “witches”, of various folk who had died unexplained and various mishaps that befell people whom the witches didn’t like. These superstitions seem to have been shared by the witches themselves, at least many of them. The Demdikes and Chattoxes used clay figures, human remains, and little effigies of victims with the intent of hurling evil at their enemies. Causality aside, Alizon Demdike did curse the peddler. “Witches think sometimes that they kill, when they do not, and are therefore as culpable, as if they did,” said their contemporary, pastor John Donne. To augment the assorted confessions and counter-accusations among the accused, Elizabeth Device’s nine-year-old daughter Jennet Device (little sister of the original peddler-curser Alizon) was summoned up to provide coached testimony against her siblings Alizon and James, against her mother, and against those at the Malkin Tower meeting. Several of these latter would be convicted of non-capital crimes or even acquitted outright, but little Jennet’s testimony doomed her own family. These witnesses would cast an evil pall well after Pendle. In later life, Jennet appears to have been caught up in the same trap, when she was accused of witchcraft by a 10-year-old boy. A judiciary grown more cautious by then did not put her to death … but she (unless it was a different person also named Jennet Device) died in prison. And the acceptability of this sort of children’s testimony, duly documented for country JP’s in Michael Dalton’s Country Justice, containing the Practice, Duty, and Power of Justices of the Peace, would be the lethal linchpin of the witch trials 80 years later across the Atlantic — in Salem, Massachusetts. This miserable event has informed any number of artistic productions from the 17th century stage to the present-day a href=”https://twitter.com/Inner_Lives/status/1017438875248218113″>Pendle Sculpture Trail. Pendle and Lancashire, as bywords for witch superstitions, now trade handsomely on the unfortunate fame. Many there have also pushed (thus far unsuccessfully) for an official posthumous pardon of the hanged witches. And the nearby village of Roughlee even erected a statue in 2012 to the hanged Alice Nutter … a gentlewoman (i.e., of considerably higher class standing than her fellow condemned) whose reason for attending the Malkin Tower meeting remains mysterious. Alice Nutter statue at Roughlee. Image (c) Burnley & Pendle Ramblers and used with permission. * Isabel Robey is an outlier case; as of this writing, she’s not even named as one of the Pendle witches on the Wikipedia page as it seems she was not associated directly with the Malkin Tower crowd — merely a bystander who got caught up in the storm of denunciations. She was, however, hanged on Gallows Hill for witchcraft on August 20. There’s a lengthy attempt at reconstructing her story in the face of scant documentation here (pdf). ** All well and good for us moderns to pooh-pooh James’s supernatural obsessions, but the man’s security concerns were very real. On this date in 1615, Scotland’s only post-Reformation Catholic martyr was hanged at Glasgow Cross. 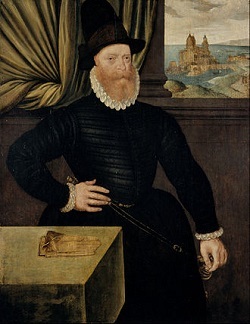 The Protestant-born Ogilvie had been educated in Europe and there fallen under the sway of the Catholic faith forbidden in his homeland. 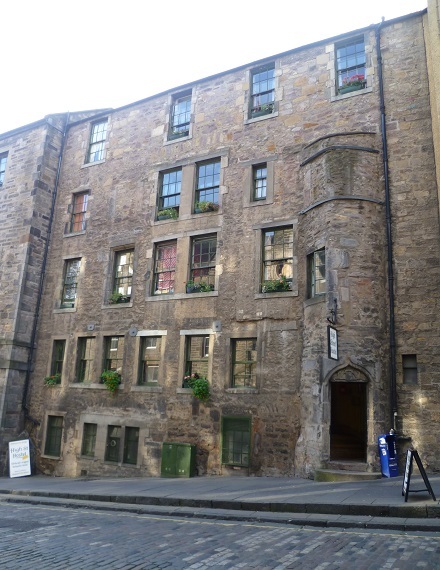 He converted, trained as a Jesuit, and at his own request returned to minister to the secret Catholic population in Glasgow. God have mercie upon mee! … if there bee heere anie hidden catholikes, let them pray for me, but the Prayers of Heretickes I will not have. There’s a multilingual Jesuit text celebrating Ogilvie available free from Google books. Glaswegians can watch for more demonstrative tribute at St. Andrew’s Cathedral, which is poised to produce a monumental mural by Peter Howson. Update: Friend of the blog Louise Yeoman, whose guest post on a witchcraft execution remains one of the best pieces in this humble space, has an interesting correction to offer on Saint J.O. 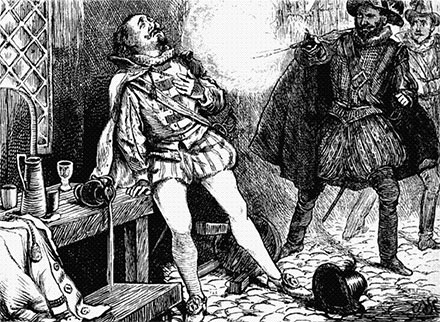 According to Yeoman, disemboweling “was not part of Scots law until 1708, when the British government wanted to hang draw and quarter some of those involved in the abortive Jacobite uprising of that year and were shocked to find that Scotland had no such penalty.” She’s backed by this contemporaneous account of Ogilvie’s death, which observes that even the “quartering” part of the sentence was not carried out. So, what gives with the image, if Ogilvie’s corpse wasn’t carved up? It’s from this (U.S.) Library of Congress page which marks it as a representation of Ogilvie in a late 17th-century text of Bohemian Jesuit propagandist Matthias Tanner. That provenance, of course, would be consistent with a bit of sanguinary exaggeration. It’s also possible that it’s mislabeled on the Library of Congress page, whose identification of it seems a bit oblique. Working as I am from secondary sources, I tread cautiously here and welcome further clarification or correction.